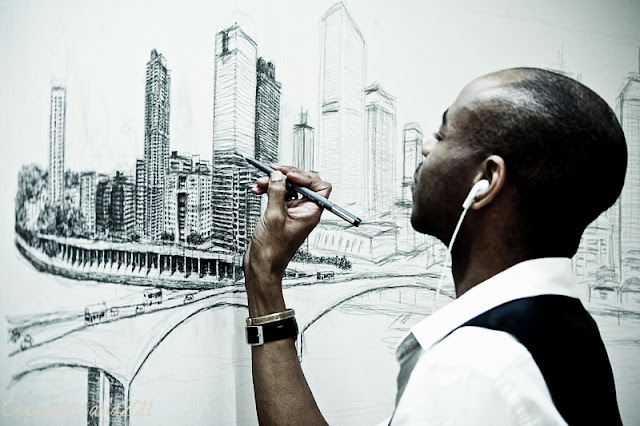 Stephen Wiltshire was born on April 24, 1974 in London, England to parents of West Indian heritage. His father, Colvin was a native of Barbados, and his mother, Geneva, is a native of St. Lucia. As a child Stephen experienced delays in his development. When Stephen was about three years old, he was diagnosed as autistic. When Stephen was about five, he was enrolled at Queensmill School in West London where the teaching staff first noticed his interest in drawing. 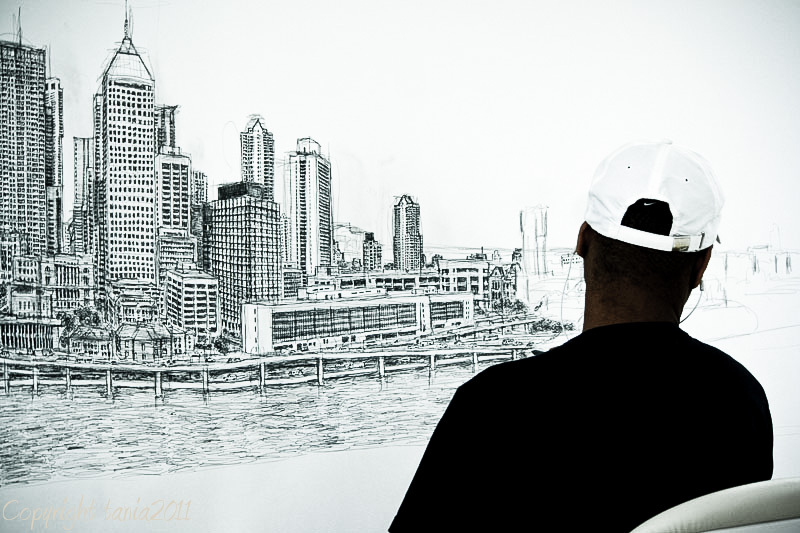 Stephen Wiltshire at the age of 9 The instructors at Queensmill School encouraged him to speak by temporarily taking away his art supplies so that he would be forced to ask for them. Stephen responded by making sounds and eventually uttered his first word - "paper." He learned to speak fully at the age of nine. His early illustrations depicted animals and cars; he is still extremely interested in american cars and is said to have an encyclopedic knowledge of them. 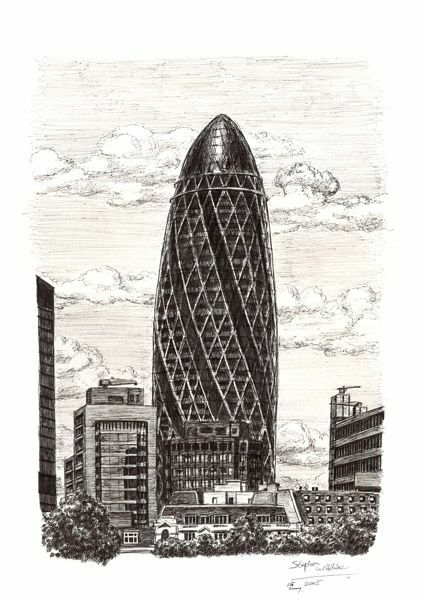 When he was about seven, Stephen became fascinated with sketching landmark London buildings. After being shown a book of photos depicting the devastation wrought by earthquakes, he began to create detailed architectural drawings of imaginary cityscapes. One of Stephen's teachers took a particular interest in him, who later accompanied his young student on drawing excursions and entered his work in children's art competitions, many of which garnered Stephen awards. The local press became increasingly suspicious as to how a young child could produce such masterful drawings. The media interest soon turned nationwide and the 7 year old Stephen Wiltshire made his first steps to launch his lifelong career. The same year he sold his first work and by the time he turned 8, he received his first commission from late Prime Minister Edward Heath to create a drawing of Salisbury Cathedral. 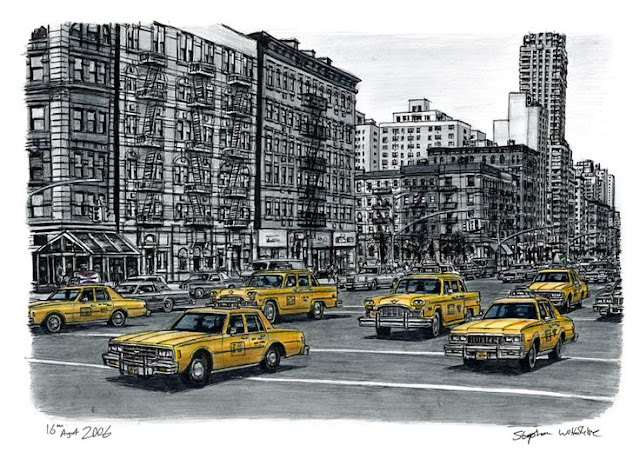 At about age 10 Stephen embarked on an ambitious project called "London Alphabet," a group of pictures depicting landmark structures in London, listed in alphabetical sequence - from Albert Hall, a famed performance venue, to the London Zoo. Sir Hugh Casson. In February 1987 Stephen appeared in The Foolish Wise Ones. (The show also featured savants with musical and mathematical talents.) During his segment Hugh Casson, a former president of London's Royal Academy of Arts, referred to him as "possibly the best child artist in Britain." Hewson arranged Stephen's first trip abroad, to New York City, where he sketched such legendary skyscrapers as the Empire State Building and the Chrysler Building, as part of a feature being prepared by the London-based International Television News. (He is quoted in the London Times article as saying, "I'm going to live in New York [some day]. I've designed my penthouse on Park Avenue.") While in New York Stephen met Oliver Sacks. With Hewson's help, Stephen enrolled in a three-year degree program (followed by a one-year postgraduate course) at the prestigious City and Guilds of London Art School, where he studied drawing and painting. He often commuted by himself on the London underground system. 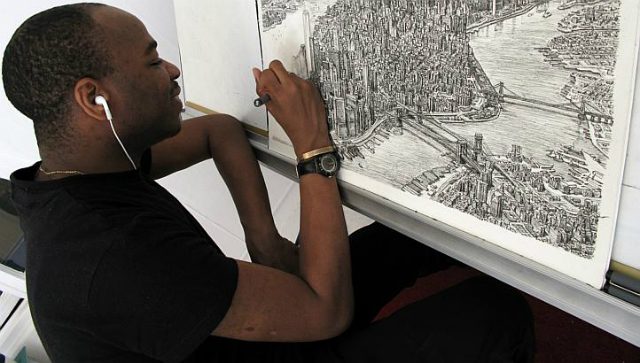 Stephen Wiltshire later successfully post-graduated in Painting and Drawing as well as Printmaking at his degree show in 1998. 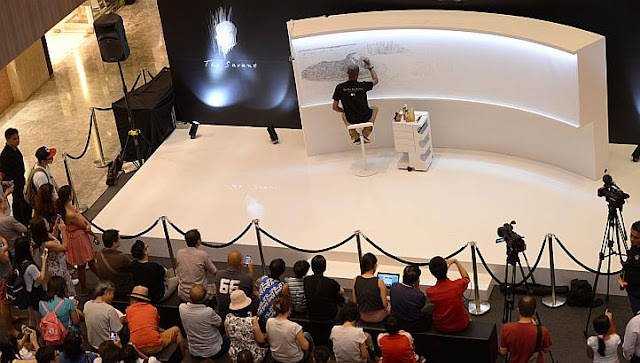 Child genius At about this time Stephen embarked on a drawing tour of Venice, Amsterdam, Leningrad, and Moscow, attracting crowds wherever he stopped to draw. He was accompanied part of the time by Sacks, who was conducting research for a new book of case histories. (The resulting volume, An Anthropologist on Mars, published in 1995, brought Stephen Wiltshire to the attention of an even wider audience.) 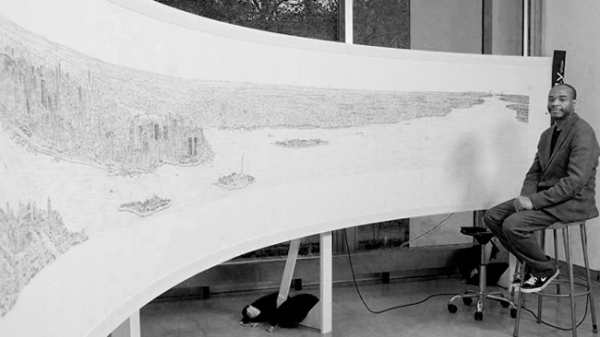 His third book, Floating Cities (1991), contains the elaborate drawings he made on the tour, along with a foreword by Sacks, who wrote, "Floating Cities represents sixteen-year-old Stephen's artistic response to a 'Grand Tour' of Europe. The architectural refinement of a bygone Venetian Republic is juxtaposed to the solid merchant spirit of the Northern Renaissance as seen in Amsterdam. The barbaric vitality and energy of Moscow is set against that epitome of elegance, Leningrad - so often called 'the Venice of the North.' These drawings testify to an assured draftsmanship and an ability to convey complex perspective with consummate ease. But more importantly, they reveal his mysterious creative ability to capture the sensibility of a building and that which determines its character and its voice. It is this genius which sets him apart and confers upon him the status of artist. For a child who was once locked within the prison house of his own private world, unable to speak, incapable of responding to others, this thrilling development of language, laughter and art is a miracle." 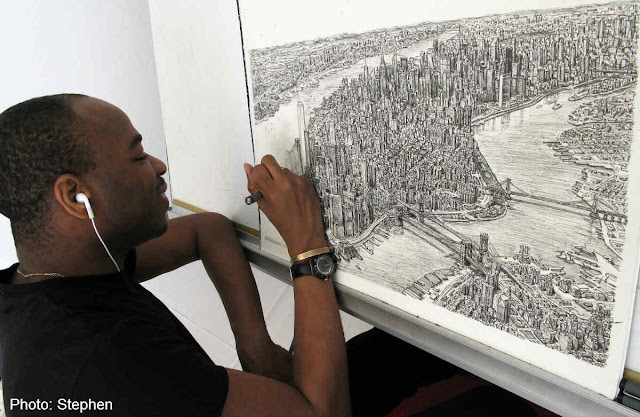 In a review of Floating Cities for the San Francisco Chronicle (February 16, 1992), Kenneth Baker observed: "The accuracy of proportion and perspective in Stephen Wiltshire's ink drawings - not to mention their detail - is amazing. 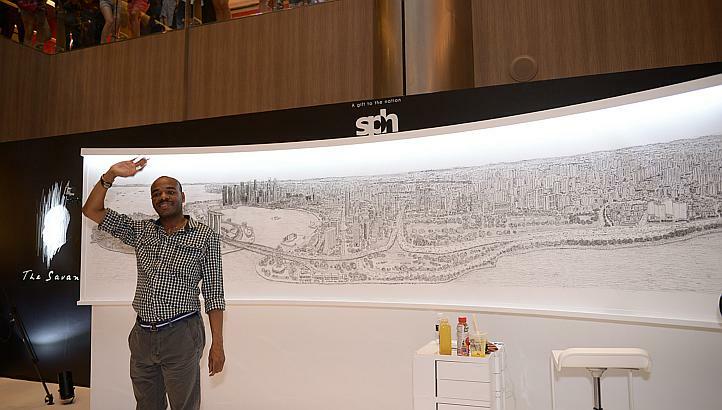 For all their busyness, Stephen Wiltshire's drawings are not snarled with obsessive rhythms. He obviously takes pleasure in what he can see and record, and his technique, though consistent, is admirably adapted to specific subjects... Whatever barriers to conventional life Wiltshire's condition [has] put in his path, his eye and hand are enviably open channels." 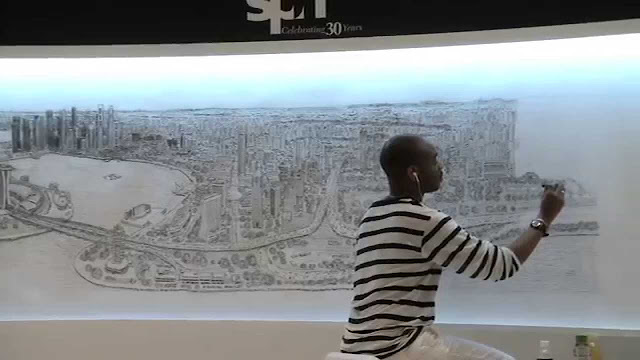 David Gritten wrote for the Los Angeles Times (February 5, 1992), "[The book] illustrates Stephen Wiltshire's ability to capture not only a building's detail; he has an innate sense of perspective and also can convey the mood a building evokes. Thus his Kremlin Palace in Moscow looks forbidding and imposing; his St. Basil's Cathedral in Red Square with its multicolored cluster of onion domes, seems to spring from a fantasy." Floating Cities reached the top spot on the (London) Sunday Times nonfiction bestseller list. In 1992 Stephen accepted the invitation of a Tokyo-based television company to tour Japan and make drawings of various landmark structures, including the Tokyo metropolitan government building, in Shinjuku, and the Ginza shopping district. 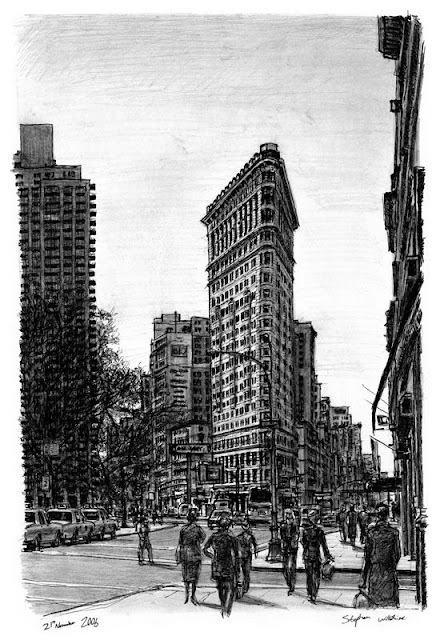 He then traveled to America once again, a trip that resulted in the book American Dream (1993), which featured cityscapes of Chicago, San Francisco, and New York, as well as the desert landscape of Arizona. Mary Ambrose wrote for the Montreal Gazette (July 31, 1993), "His paintings of the Arizona desert [establish] him as more than a one-trick pony, and although the coloring is a bit rough, his strong natural sense of composition keeps it together." Stephen also included depictions of friends and acquaintances, and some observers took the presence of human figures in his work as a sign that he was developing socially. 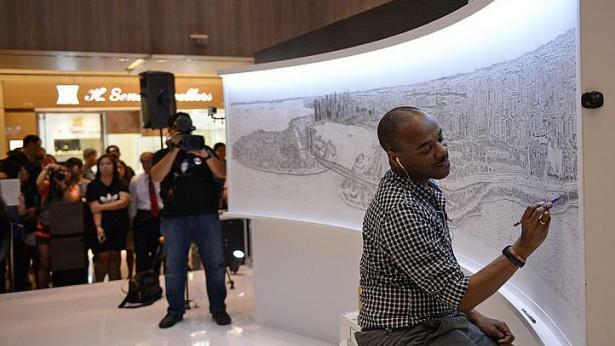 While his teachers had long known that Stephen Wiltshire liked to sing, the extent of his musical talent was not immediately apparent. Hewson told Anne Barrowclough for the London Daily Mail (September 14, 1993) that she discovered the artist's additional skill while on the trip to Russia: "When we were in Moscow we would throw our own private concerts, usually opera, in our hotel room. One evening Stephen stood on a chair and sang Carmen from memory. He had picked it up from the television and remembered it almost perfectly." He soon began studying with the music teacher Evelyn Preston, who identified Stephen as having perfect pitch - the rare ability to identify the pitch of an isolated musical note. Additionally, while people with autism often do not understand or recognize human emotions, Stephen seemed able to convey the story of the music he was hearing and interpret its sentiments - an ability that fascinated psychologists. The medical community also found Stephen's case interesting because savants rarely exhibit simultaneous skills in more than one field of learning. Linda Pring, a cognitive neuropsychologist at Goldsmith's College, in London, spent a summer evaluating Stephen in an effort to discover a relationship between his dual talents. Pring told Nigel Hawkes for the London Times (September 13, 1993), "None of our other savants has more than one talent. In the whole of the scientific literature I have found only one previous example." 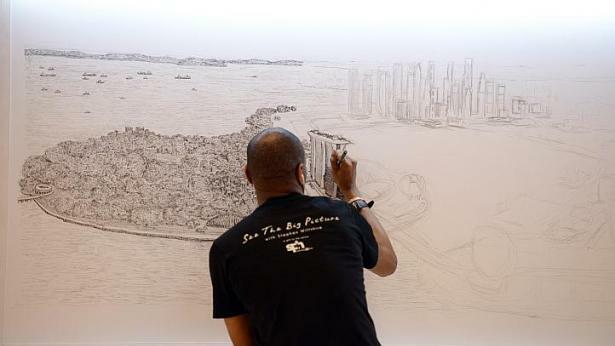 In December, after a 20-minute helicopter ride, Stephen spent a week creating a 10-meter-long drawing of Hong Kong's Victoria Harbour and the surrounding urban scene. (He dedicated the work as a Christmas present to the city's residents.) 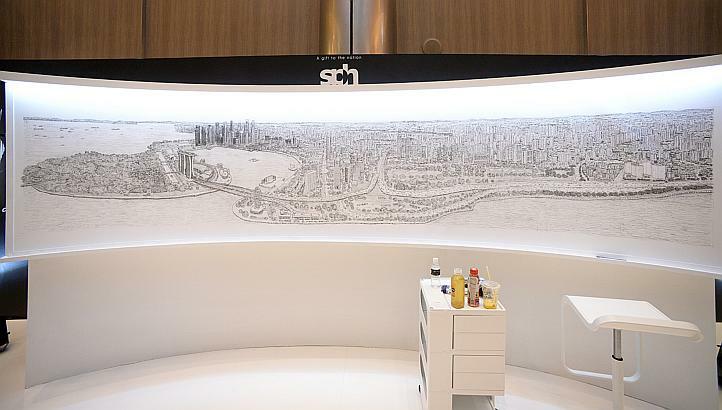 Since then he added Frankfurt, Madrid, Dubai, Jerusalem and London to his collection. 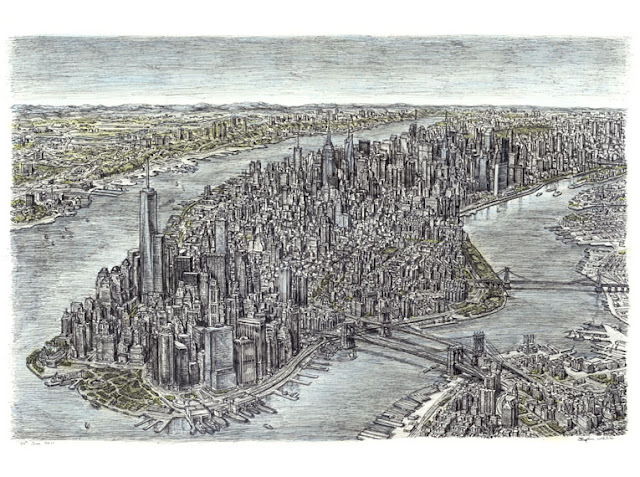 The last drawing in the series was of his spiritual home, New York. Further trips followed to Sydney and Shanghai in 2010. 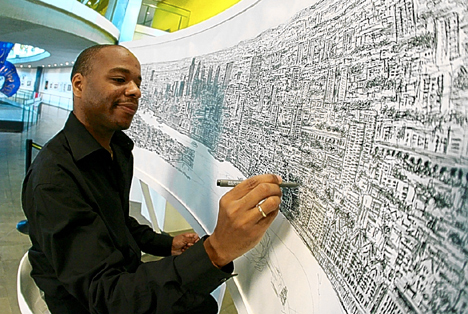 Stephen Wiltshire receives MBE for services to artIn January 2006 it was announced that Stephen was being named by Queen Elizabeth II as a Member of the Order of the British Empire, in recognition of his services to the art world. "It's an absolute honour," his sister, Annette, told Geoffrey Wansell for the London Daily Mail (January 3, 2006). "It brought tears to my mum's eyes and to mine, because we've all worked so hard for Stephen." 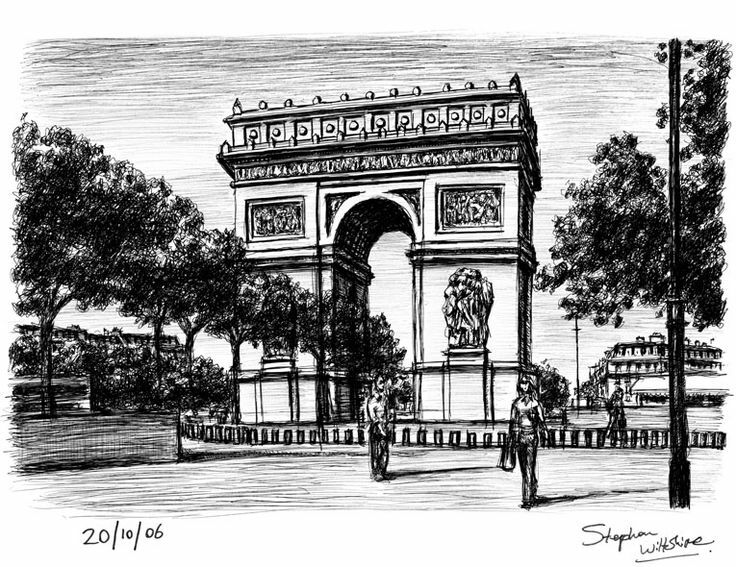 In 2011, Stephen received an Honorary Life Fellowship from the Society of Architectural Illustrators, presented by artist Ben Johnson. The gallery recently celebrated its 5th year of opening and the search for Stephen's second premises in New York continues today. Many observers have noted that Stephen has an engaging personality and a strong sense of humor. He sometimes performs impromptu, but wickedly accurate imitations of such singers as Robbie Williams. He currently resides in Maida Vale, West London with his mother. He reportedly admits to a preference for blondes, most notably the actress Jennie Garth from the television series Beverly Hills 90210.